Last week was the 9th week of the 2019 legislative session. We are now half way through the 18-week session. Here are the highlights from Senate floor action last week. 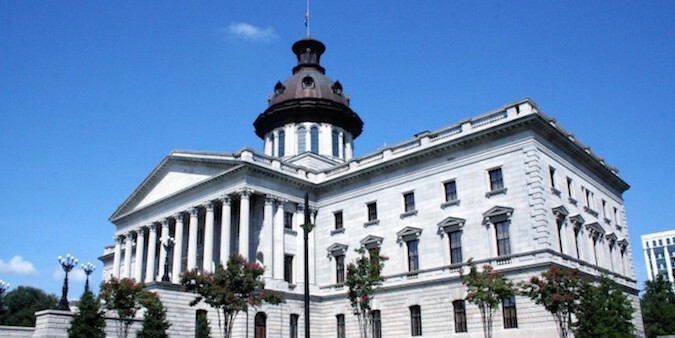 PROFESSIONAL LICENSES FOR MILITARY SPOUSES – The Senate passed S. 455, a bill that would allow spouses of South Carolina-based, active duty armed service members to receive temporary professional licenses (engineer, cosmetologists, contractors, etc.) if they have met licensure requirements. The bill will now go to the House of Representatives. IGNITION INTERLOCK DEVICES – In an effort to strengthen our state’s DUI laws, the General Assembly passed legislation a few years ago to require people with multiple DUI convictions or very high blood-alcohol levels to install ignition interlock devices (IID) on their vehicles. After an IID is installed on a vehicle, the vehicle will not start until the driver blows into the device and registers a blood-alcohol level that is below 0.08%, the legal limit in South Carolina. Last week, the Senate passed S. 18, a bill that would require every person convicted of DUI to install an IID on his or her vehicle, even after a first offense. The House will now consider the bill. COMMON SENSE DEFINITION OF “CHILD ABUSE AND NEGLECT” – The Senate passed S. 79, a bill that would ensure that allowing a child to play outside, stay at home, or engage in many routine, independent activities are not to be considered as child abuse or neglect if the child is of sufficient age and his basic needs are met. The bill has been sent to the House of Representatives. SPEECH-LANGUAGE PATHOLOGISTS – The Senate passed S. 277, a bill dealing with the licensure of speech-language pathologists. The House will now consider the legislation. PHARMACY BENEFIT MANAGERS – The Senate passed S. 359, a bill that would authorize and require licensure for pharmacy benefit managers (PBMs). These PBMs would work with pharmacies to process claims and negotiate with pharmaceutical manufacturers for lower drug costs. The bill has been sent to the House. COMMUNICATION DEVICES IN PRISONS AND JAILS – The Senate passed S. 156, a bill that would make it a crime to possess a cell phone or other telecommunication device inside a prison or jail unless authorized by official in charge of the facility. The smuggling and use of cell phones in prisons has been a major problem for the Department of Corrections. The House of Representatives will now consider the bill. K-12 EDUCATION REFORM – There has been a good bit of conversation this year about reforming our K-12 education system to provide better working conditions for teachers and more and better opportunities for students. Last week the House of Representatives passed H. 3759, a bill designed to address those issues. However, the bill has met with opposition for many teachers. I expect the Senate version of the bill to be different in many respects from the version passed by the House. The full Senate Education Committee will likely consider an amended version of H. 3759 the first week in April, and I hope the full Senate will debate the bill later in April. BUDGET – The House of Representatives will debate the 2019-2020 state budget this week. The current schedule would have the Senate debate the budget the week of April 15. I will provide more details as we get closer to the Senate consideration. On Monday, I talked with teachers and spoke to a political science class at Strom Thurmond High School. On Monday night, I attended a K-12 reform hearing held by the Senate Education subcommittee at McCormick Middle School. On Thursday night, I attended the monthly meeting of the Ridge Road Community Club in Leesville. I enjoyed the fellowship and the opportunity to share a legislative update. STHS STATE CHAMPIONS – Last weekend Strom Thurmond High School’s mock trial team won the 2019 state championship. The Rebel team will represent South Carolina at the national tournament in Athens. Georgia in early May. Congratulations!